My first marriage failed. We parted peacefully, I am in my second marriage now. Everything is working perfectly well for us. I love my new wife so much and she loves me too. One thing we agreed from the outset is that there would be separation or divorce. And that whatever we get in marriage, we would take it. We are living by that decision and everything is fine with us. I am not the kind of person that would begin to condemn whoever I was into a relationship with before now. I just felt that we were not compatible. She has since moved on with her life and I too. My second marriage is still young but we are doing very well. I am happy with my wife and she’s happy with me. That’s what marriage is all about. She’s into a business venture. I met her many years after my first marriage crashed. I avoided being in a relationship for many years. I felt that if the crashing of my first was my error or her error, I needed time to reconsider my decision about marriage. But I’m happy everything is working out fine. For a while, she was not around but she’s back now. I met her at a Nollywood function in Lagos. A friend of mine invited her to the event, and when I sighted her at the event, I was immediately attracted to her. There and then, we got talking, exchanged our telephone numbers. Later, after all the inquiries about her, I told her it’s time we take our relationship to the next level. I said to her there was something about her that I liked. Definitely she did. But she asked me to give her some time to think about the proposal. She went to town to make inquiries about me and all that. I was lucky because all the people she consulted gave a very good account of me. And it made things a lot easier for me to win her heart. I was plain to tell her my story and gave her the liberate to go out there and verify it. That was what she did, and at the end of everything, she came back to me. There was something about her that struck my fancy. She was at the event in the company of her friends and she was smiling infectiously while posing for shots. And it caught my attention. When I met her outside the event arena, I approached her and introduced myself to her. Few days later, I put a call across to her, even though she was not expecting my calls. I think it was my love story. It wasn’t as if she was desperate. She had other suitors who were not married before like myself. They were much younger and have been mounting pressure on her. Even her friends and some of her family members kicked against her decision to marry me because they felt I was once married. On my part, some of my friends were asking questions, whether I know her very well to think she would make a good wife. But she stood her ground, insisting that she would marry me. And that’s what I liked about her. What I did was to exposed her to my kind of person. I am that kind of a man that stands by his words. And all those things I told her then are the things that have helped our marriage. I have not changed from what I was when I married her. And she has never had any reason to remind me of what I used to be in the past. I’m still the same person she married. We lived together for a year, before we got married about two years ago. She likes the fact that I’d warm up to people : that I am a man of my words. She sees me like that so much so that she has built trust in me. And on my own, I try as much as possible not to kill the trust. When somebody trusts you, you should try as much as possible not to abuse the trust. Yes, we dated for close to two years before we finally got married. While dating we were not too close to each other. It was more of a telephone conversation all the time. Actually, she was afraid of coming close to me because as an actor and producer, she believed women were always around me. Also, then I have not really decided whom I should ask for her hand in marriage. This is because there was another lady I was eyeing then. But my wife now showed me more love than the other lady. There is nothing like marrying a woman that would give you a peace of mind. What I cherish so much in life is that when you are having challenges and you look around and you see your partner by your side. There’s nothing that kills a relationship than when you are moving with somebody and something happened and you look behind you can’t find the person again. It kills any relationship. Somebody that cares about your well being. From time to time, she calls you to find out how you are doing. It’s very important and it helps to build a marriage. Yes, she is. There is something I noticed about her that I didn’t notice in my first marriage. May be, I was the demon which my ex-wife could not tamed and she had the capacity to tame me. Whatever happened, I tried my best in that marriage, and may be , the other partner did too. But by the time I was walking out of that marriage I wasn’t planning to go back again. I looked at the whole scenario and concluded that it’s better we go our separate ways. Let her move on with her life, while I move on with mine. I am happy she has moved on, doing well in her own calling, and I’m not doing badly too. It wasn’t a loud one. I had called my wife and told her about the position of things. We had traditional marriage which was quite huge and had a lot of my friends in attendance. I told her I wouldn’t want our wedding to be elaborate because it’s something I have done before. I just invited few of our friends, family members and well wishers. We went to the church and from there to the reception venue. We had fun and that was it. Before the marriage, she needed the confidence to get into it. She needed to know what she was stepping into. This is because there was a lot of pressure coming from both her family members and her friends. 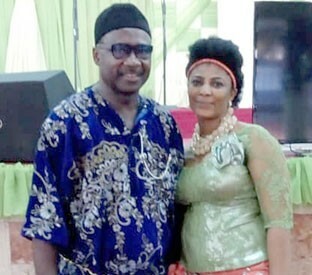 They were skeptical about her marrying a Nollywood practitioner. They believed that our marriages don’t last at all. Some people predicted that the marriage would collapse within six months, or one year. We are still married till date. We also have our own misunderstanding. I once told my wife that she did not marry a perfect man. I commit a lot of errors per minute and I said to her that at the end of the year, I’m going to give her a lot of ‘I’m sorry note” and that she should go and deposit the notes in the bank. Any day I commit any error, she should just withdraw one “I’m sorry” to make up for the wrong. I belong to that category of men who do not know how to do romance. But what my wife has been able to do for me is that she has taught me to be romantic. I used to call her, her name until she opted for a pet name. At first, it was very heavy for me. She doesn’t call me my name. In fact, she teaches how to do romance on a daily basis. An African man has no time for romance, but it lubricate the marriage. She has helped me to get used to some of these things I don’t do regularly. I try as much as possible to ensure that she does not lack anything. Whatever comes to me, I think of my wife first. She’s my first priority even before my parents. I try as much as possible to provide for her and when there is nothing in the house she shows understanding. Whenever anything happens, I try to show her love, appreciate her as my queen. Sometimes, I listen to her and take things from her own perspective. From my experience, lack of understanding and trust destroys marriage. A woman needs to understand her husband and build some trust in him, without which the marriage can’t survive. I’m not one of those people who don’t believe in marrying in the industry, or marry from another tribe. It’s not about the tribe but your orientation. There are many actresses in Nollywood who are actually good materials for marriage. When I was searching for a wife I threw it up, saying I was looking for somebody who would understand me. Many ladies responded and in fact, there was a particular lady in the industry whom a friend recommended to me. I tried to be friendly with her, but what put me off was that she felt I wanted to take advantage of her. When I saw the signs I decided to withdraw from her. So, after I got married, I invited her and opened up to her. She started crying and I told her that I wanted her to be herself and that was why I didn’t open up initially to her. But it was too late then.